James Highsmith, MD, MS is a true Floridian born right here in Tampa! He wrestled for Brandon High School and later graduated from the University of South Florida. At USF he earned a Bachelor of Science degree in Education and became a certified Hillsborough County school teacher in 1998. 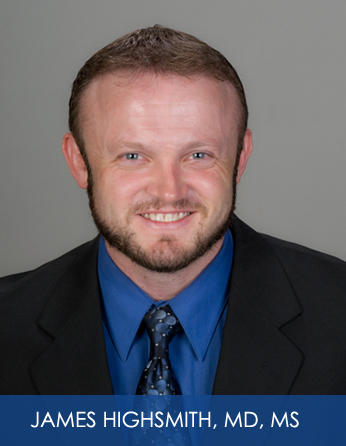 He moved to Gainesville in 1999 and graduated from the Physician Assistant program in 2002 where he served as Vice President. After earning a Master’s Degree from the University of Florida, he returned back to Tampa to practice internal medicine as a Physician Assistant. However, he found his true calling in 2003 at the dermatology section of the James Haley VA hospital. He has been pursuing, learning, teaching and involved with dermatology ever since. Doctor Highsmith loves to learn and was infatuated with dermatology and caring for our nation’s heroes. Working at the VA allowed him the opportunity to publish medical articles as well as teach medical students, PA students, and ultimately inspired him to become a physician. Doctor Highsmith remained at USF for medical school and was elected into the Alpha Omega Alpha medical honor society graduating near the top of his class. He moved his family to the big apple for his dermatology residency. There he lived on Roosevelt Island in New York City which was an amazing experience. After residency, he began moving south but first settled in Birmingham, Alabama where he completed a coveted fellowship in Mohs Micrographic Surgery and Procedural Dermatology with one of the most renowned Mohs surgeons and respected dermatologists in the world, Doctor Gary Monheit. During fellowship, Dr Highsmith was able to assist in clinical trials for new neurotoxins, fillers, and even ATX-101. ATX-101 was eventually re-named to Kybella and received FDA approval in May of 2015 for double chin neck fat. Apart from the initial investigators, Doctor Highsmith was among the very first physicians trained to use and administer Kybella in the United States. As a subinvestigator for Allergan and Evolus, he was also fortunate to work in clinical trials and extensively use as well as study neurotoxins. Additionally, he is considered an expert in the field as he has published in peer reviewed journals, wrote book chapters and lectured at national meetings. Medical dermatology, Mohs micrographic surgery, surgical reconstruction, volume fillers, neurotoxins, neck contouring, and skin resurfacing are his areas of specialization. He is board certified in dermatology and fellowship trained in Mohs Micrographic Surgery and Procedural Dermatology. Highsmith MJ, Kahle JT, Lewandowski A, Klenow TD, Orriola JJ, Miro RM, Hill OT, Raschke SU, Orendurff MS, Highsmith JT, Sutton BS. Economic Evaluations of Interventions for Transtibial Amputees: A Scoping Review of Comparative Studies. Technology & Innovation 18(2), 85-98. http://dx.doi.org/10.21300/18.2-3.2016.85. Highsmith MJ and Highsmith JT. Skin Problems in the Amputee. Volume 2: Lower Limb Management Issues. Section 4. Ch 56. p677-696. In: Atlas of Amputations and Limb Deficiencies. Surgical, Prosthetic and Rehabilitation Principles. 4th ed. Volume 2. Editors: Krajbich JI, Pinzur MS, Potter BK and Stevens PM. American Academy of Orthopaedic Surgeons. Rosemont, IL. ©2016. Highsmith JT. Evaluation of the Safety and Efficacy of Treatment with BOTOX® (Botulinum Toxin Type A) Purified Neurotoxin Complex for Subjects with Forehead and Glabellar Facial Rhytides . Sub-Investigator. Site PI: Monheit G.
Highsmith JT. Safety and Efficacy of DWP-450 in Adult Subjects for Treatment of Moderate-Severe Glabellar lines. Phase III, multi-center, randomized, double blind, placebo-controlled, single dose, trial. Sub-Investigator. Site PI: Monheit G.
Highsmith JT, Koubek V, Monheit GD. Atrial Fibrillation Induced by Local Anesthesia with Epinephrine for Mohs Micrographic Surgery. Dermatol Surg, 42(5):686-8. Highsmith MJ, Latlief GA, Sepulveda E, Shamp NJ, Nelson LM, Switzer JD, Highsmith JT, Randolph BJ. Elastic Strengthening Band Grasp Solution for Individuals with Upper-Limb Amputations. Journal of Prosthetics and Orthotics, 28(2):88-92. Highsmith MJ, Cummings S, Highsmith JT. Furunculosis in a Transtibial Amputee. Phys Med Rehabil Int, 1(3): 4. Cheema A, Highsmith JT, McCardle T, Castillo E, Sandin RL, Velez AP, Toney JF, Greene JN. Cutaneous Manifestations of HTLV-1 Infection: A Case Report. Infectious Diseases in Clinical Practice, 20(6):435-437. Highsmith JT, Cheema A, Castillo E, Sandin, RL, Velez AP, Greene JN. Detection of Cryptococcus Infection From a Contaminated Autologous Stem Cell Harvest. Infectious Diseases in Clinical Practice. 20(1):71-74. Highsmith MJ, Highsmith JT, Kahle JT. Identifying and Managing Dermatological Issues with Lower Extremity Prosthetic Use. In Motion. V21 Issue 1, p41-43. Highsmith JT, Highsmith MJ. Diagnosis and Management of Skin Pathology in Lower Extremity Prosthetic Users: Case Reviews. Journal of the American Academy of Physician Assistants, 11(20), p33-37. Highsmith JT, Highsmith MJ, Monheit GD. Frozen Section Concordance of Mohs Micrographic Surgery. Tromovitch Award Abstract Session. American College of Mohs Surgery (ACMS). National Meeting, Orlando, Fl. Highsmith MJ and Highsmith JT. Dermatology in O&P. Organized Session (OS3). American Academy of Orthotists and Prosthetists (AAOP), National Meeting, Orlando, FL. Kahle JT,Highsmith JT, Klute GL, Orendurff M. Discussion of Sub-Atmospheric Vacuum Assisted Suspension. Organized Panel Session (#OS14): AAOP (American Academy of Orthotists and Prosthetists), 39th Annual National Meeting & Scientific Symposium, Orlando, FL. Highsmith JT. Dermatologic Problems in the Orthotic and Prosthetic Client-Diagnosis and Management: A Dermatologist’s Perspective. (Module 2). Invited Lecture. American Academy of Orthotists and Prosthetists (AAOP) One Day Seminar Series on Dermatology and Wound Care for Prosthetists and Orthotists, Rosemont, IL. Highsmith JT. Dermatologic Problems in the Orthotic and Prosthetic Client-Diagnosis and Management: A Dermatologist’s Perspective. Certificate Program (#DW1): AAOP (American Academy of Orthotists and Prosthetists), 39th Annual National Meeting & Scientific Symposium, Orlando, FL. Highsmith JT, Highsmith MJ, Carroll K. Skin Issues in O&P. Organized Session (OS6). AAOP (American Academy of Orthotists and Prosthetists) National Meeting, Atlanta, GA.
Highsmith JT, Guest Lecturer. University of South Florida. College of Medicine. School of Physical Therapy & Rehabilitation Sciences, DPT Program. Course#: PHT 8702 Advanced Prosthetics and Orthotics. Tampa, Fl. Highsmith JT, Dermatology and the Artificial Interface. LAOP (Louisiana Academy of Orthotists and Prosthetists) State Meeting. Kenner, LA. Highsmith JT, Guest Speaker, Advisor, Cunsultant for Hillsborough Community College Health Pre-Professional Organization (HPPO). Founder and Senior Advisor: Professor Elizabeth McCullough, MS. Brandon, Florida.